You know the feeling: you are coming home from the airport after a long trip and flight, there is not much in the refrigerator and you are not looking forward to a grocery run. But you at least need milk for tomorrow morning's coffee. And if you are like me, you just can't get too excited about a bowl of cereal for dinner. Even though really, tomorrow will be another day and a better meal. Just one evening without something tasty should be ok? No No. Not to be. Can't do it. This time, coming home by myself to an empty house, I do walk to the store to get milk and while there, pick up some romaine hearts. I know I have cans of tuna, pasta and capers always in the pantry and fresh lemons always in the refrigerator or freezer, so I plan on a quick pasta with tuna for dinner. A quick Ceasar salad on the side and everything is right again and I feel at home. I can wait til tomorrow for that major grocery trip. While cooking the pasta, heat the olive oil in a small skillet, add the garlic and let simmer in the oil for a minute or two. Don't brown. Add the capers, tuna and heat through. Fold in pasta and top with pepper to taste, parsley and a squeeze of lemon. Wash the romaine hearts, dry, then keep in refrigerator to chill until you are ready to eat. Crush 1 garlic clove and mix with 1 teaspoon dijon mustard, a scant 1/4 cup fresh lemon juice (I keep quarters of frozen lemons in the freezer in case I am out of fresh lemons) and 1/2 teaspoon anchovy paste (I always keep a tube in the refrigerator). Whisk in 1/3 cup olive oil. 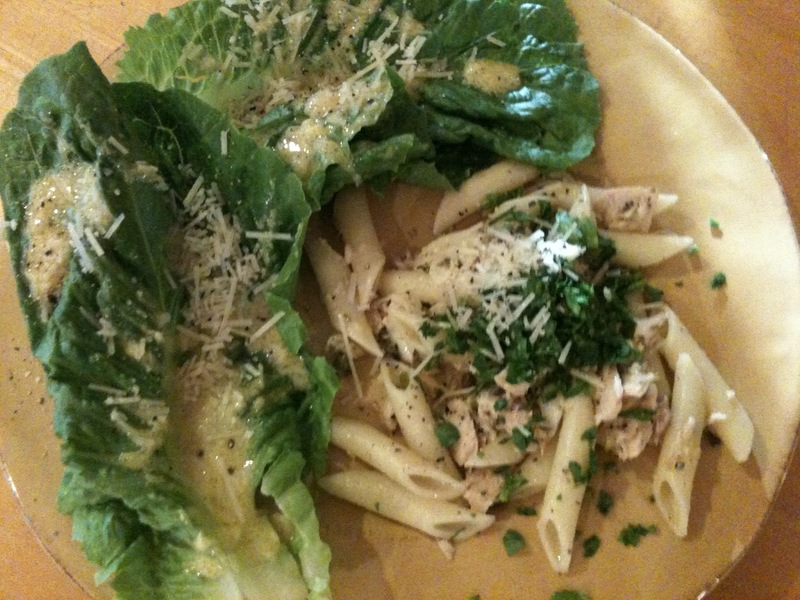 Serve on romaine leaves with freshly ground pepper and shredded Parmesan. A charcuterie platter like the one at Spruce that I highlighted in my last blog entry is an inviting casual dinner party appetizer but an even simpler one that I often put together is a prosciutto platter. Simply cover an attractive platter with thin slices of prosciutto and accompany with a bowl of cornichons, a slab of butter, a trio of varied salts, and a basket of fresh bread slices. (Either an Italian or, surprisingly, a good rye bread are both great with the prosciutto).